Dumpster Divers Are Stealing Your Information – Take Action! In the case of California vs. Greenwood, it was held that the Fourth Amendment does not prohibit the warrantless search and seizure of garbage left for collection outside the curtilage of a home (pp. 39-44). The Supreme Court ruled that there is no expectation of privacy or ownership once an item has been placed in a trash receptacle in a public area (for example, on the street). The court noted, “Garbage on a public street is readily accessible by animals, snoops, scavengers and other people,” and therefore it is legally considered abandoned. This ruling has been applied to both police searches and private theft cases. 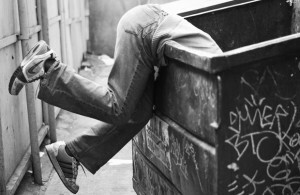 In the same way that you wouldn’t leave important personal documents in the trash outside of your house, you wouldn’t leave important, professional documents (or electronics) in your company’s dumpster. Companies are constantly investing in new technology and in many cases, dispose of their old electronics, such as computers and tablets, in dumpsters without any thought. This is a prime opportunity for identity thieves to go dumpster diving in attempt to acquire documents and electronics containing very valuable pieces of information. These thieves can obtain street addresses, social security numbers, email addresses, banking information and employment history. In turn, these thieves can engage in damaging activities such as identity theft and an assortment of fraud, such as employment-related fraud, loan/bank fraud, benefits fraud, and tax fraud. Protect yourself from identity theft. To learn more about our on-site shredding, particle size, and the other document destruction services, click here.